Last week, after 30 days of investigations about a very suspicious project, I published an open letter to Kickstarter CEO Yancey Strickler. 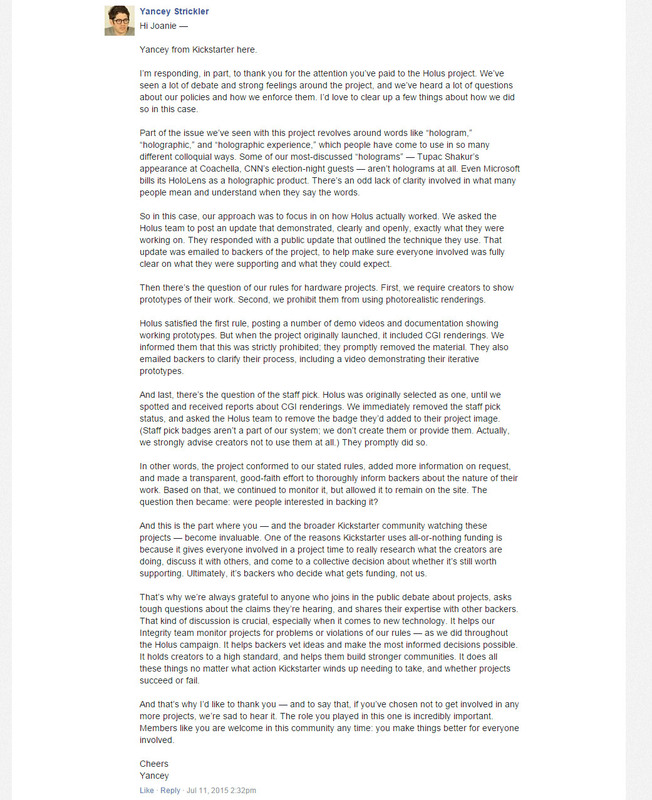 He replied over the weekend (read the comments), after the project succeeded, only to confirm most of my doubts. Here are my reply and comments. Read also: « Kickstarter failed us » from Raphaël de Courville. You guys are really hard to reach! I’ve been trying to get in touch for over a month, but didn’t get any significant feedback until now, so I read your letter with great attention. Let’s be clear: Holus has been advertising a « revolutionary 3D holographic experience » what is basically a « 2D display reflected on a piece of glass« . – misleading use of the words « 3D » and « holographic » (the fact that other companies also did it, is not a valid excuse, imho). 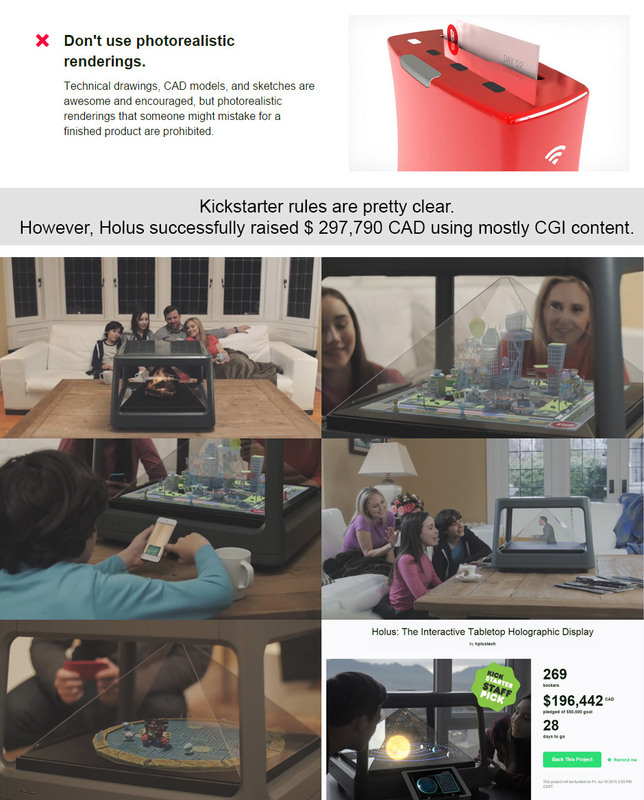 – prohibited CGI (silently replaced after 75% of the backers were fooled, and already pledged $220.000 CAD ). H+ clearly broke your rules, but still, their project succeeded. What is the point of having rules, if these are not enforced ? I feel sorry for the 496 backers who will never receive the « 3D holograms » they paid for. It’s hard to believe you’ve chosen to support this project, this sends a terrible message to your community, and a serious breach of trust, but it’s your call. 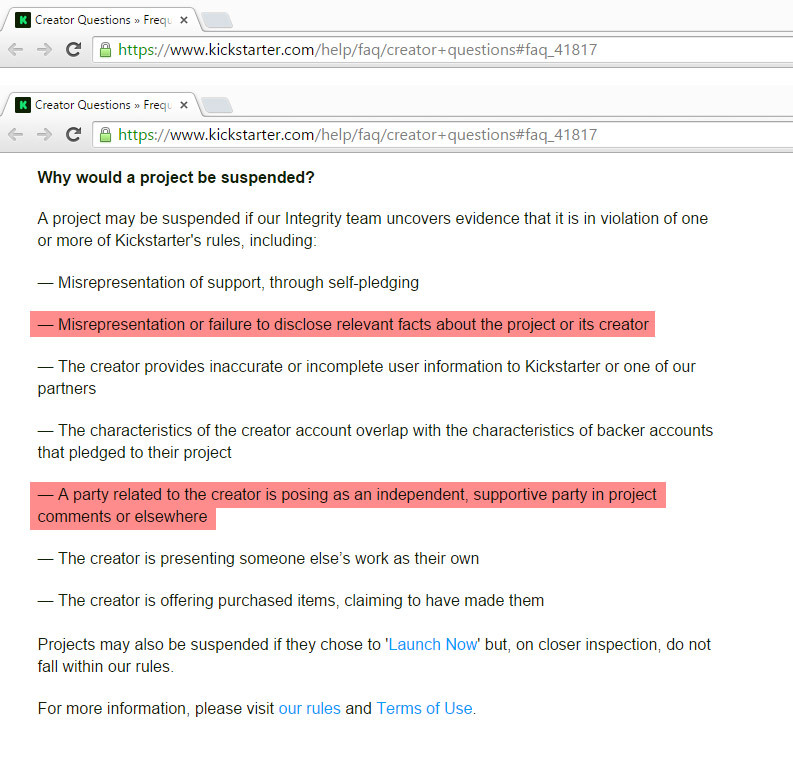 Kickstarter has been passive aggressive while covering up the Holus project. – YOU DID NOT REPLY to the official ‘reports’ made from day 1 (except email auto-replies). – YOU DID NOT LISTEN to the experts: Jason Sapan has been making real holograms in NYC for over 40 years, he warned you about the fraud. – YOU DIDN’T CARE TO COMMENT the 3 in-depth articles (1 – 2 – 3) written by Raphaël de Courville about his investigations on the scam. – YOU DELETED the embarrassing questions asked in the project comments (see screenshots). – YOU DID NOT MODERATE messages from suspicious accounts (1 – 2) and Holus partner comments (1) who broke another rule. – BACKERS WERE NEVER INFORMED about the replacement of prohibited CGI and removal of staff pick status. An now you’re telling us that « Staff pick badges aren’t part of Kickstarter« , I think it’s an alerting sign of the lack of supervision on your platform. In my opinion, your monitoring system is opaque, and open discussion is discouraged. It would be dishonest to pretend otherwise. My studio is full of awesome projects I pledged from your website, but currently I think Kickstarter is broken, and I’ll be boycotting it until some actions are taken to better protect your community.